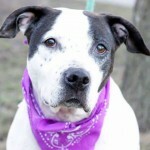 Are you looking for a laid back, gentle, clean, affectionate dog? Do you need a dog that’s good for apartments? 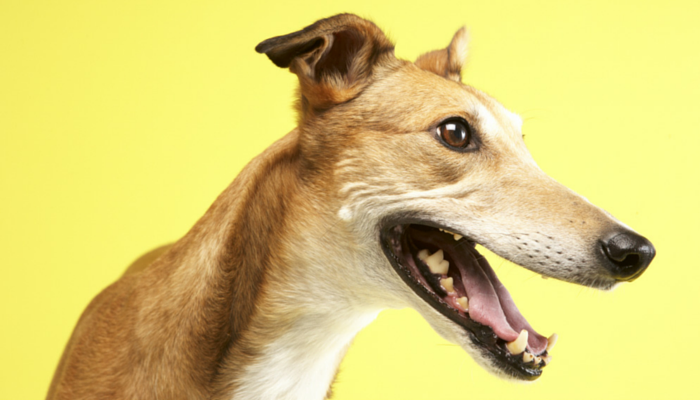 A Greyhound might be the right dog for you. Despite being known for racing, Greyhounds are actually one of the most laid back breeds around. If you’re looking for a low maintenance dog a Greyhound could be the right dog for you. Greyhounds make excellent companions — give them love and a warm place to sleep and they’ll repay your kindness by becoming your best friend for life. April is adopt a Greyhound month and I wanted to celebrate by showcasing why they make the perfect companion for nearly any family. Despite the fact that many Greyhounds have come from a neglected life on the racing track these dogs are highly adaptable to a home environment. Give them some love, affection, and a nice warm place to nap and they’ll be your best friend for life. Although there are a small number of Greyhounds bred for the show ring most adoptable Greyhounds are retired racers. So when you adopt a Greyhound you’re not only gaining a best friend – you’re helping support the community of people dedicated to giving these guys a second chance after a rough start to life. Next time you’re looking to add a canine companion to your family consider a Greyhound. It’s hard to find a more laid back, gentle, quiet, and adaptable dog. Here’s a list of 18 excellent reasons to adopt a Greyhound. They’re quiet indoors, laid back, and love to lounge around in their favorite comfy spot. They’ll be happy to lay around all day while you go to work. They require less exercise than many other breeds. They’re very gentle dogs and are naturally reserved. 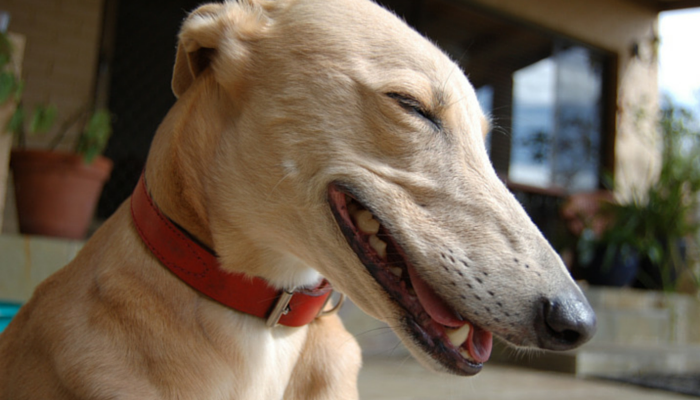 Greyhounds have wonderful manners indoors – they’re quiet, clean, gentle, and mild mannered. If you’re looking a dog that’s easygoing and known for being well mannered when meeting new people a Greyhound will make a perfect companion. They love to go out on adventures with their family. Whether you enjoy hiking, jogging, or exploring new parks your Greyhound will love to be part of the adventure. Their polite and gentle nature makes them excellent buddies for travel and meeting new people and pets. 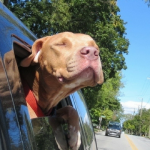 When adopting through a rescue organization they’ll be able to match you with a dog that matches your active lifestyle. Give your Greyhound a nice warm, comfy spot to lay in and they’re good. Many Greyhounds sleep as much as 16 – 18 hours a day. You will also be amazed by their ability to sleep in very odd positions. Known as “roaching” Greyhounds will lay on their back and have their long legs extended at all different angles. They’re perfect for those who love to enjoy a nice daily walk and a relaxing evening at home. Due to their gentle nature Greyhounds make excellent companions for the whole family. Retired racers adapt well and thrive in a home environment. They’re Sweet, gentle, loving, clean, quiet, and smart – making them excellent family pets. Those who have adopted Greyhounds belong to a special group of people devoted to this wonderful breed. Instead of just adopting a new best friend you’ll be joining a community that sticks together to help dogs in need. You’ll find yourself with a new set of friends that are willing to lend a hand and help with any questions or concerns you might have. Who doesn’t love a canine cuddle buddy? While temperaments vary by individual dog most love to follow their human companions around and cherish human affection. You’ll always have a companion happy to be right by your side and ready for a nice cuddle. Their short coat is sleek and easy to care for – easily maintained by weekly grooming and an occasional bath. They’re shedding is considered average. As with other rescue dogs when you adopt a Greyhound you’re saving a dog in need. By adopting you’re helping to make room for these rescues to help other animals in need. Many people who have adopted or rescued an animal are amazed by their gratefulness; they love nothing more than being given a second chance. A lot of us like to sit back and relax after a long day at work – your Greyhound will gladly join you on the couch. They won’t even complain if you end up watching a Golden Girls marathon – just being close to you is reward enough for them. These beautiful dogs come a variety of colors from white to black, brindle to grey, tan to red, and any combination of these colors with white spots. Compared with other breeds of the same size Greyhounds have an longer average life expectancy of 10-13 years. Due to their selective and careful breeding for the track their health concerns are considered minimal compared to other breeds of the same size. Adopting an adult Greyhound means you can choose a dog that will fit right in with your family. Do you have cats? Children? Other dogs? Work long hours? The rescue agency will be able to make a match based on your current situation. Can dogs get any cuter or more perfect than this? If you’d like a dog you can take with you to the market or park a Greyhound will make an excellent partner. They’re known for being very gentle and polite when meeting new people an dogs. They’re not known for being aggressive or pushy. Their polite nature makes outings with them easy and nearly effortless. Getting your first dog is overwhelming so make it easy on yourself and choose a laid back companion like a Greyhound. They’re a low maintenance breed that is highly adaptable to living in any home environment including apartments. When you welcome a Greyhound into your home you’ll gain a companion for life. 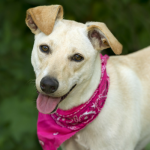 Contact a local Greyhound rescue agency and they’ll help you find your perfect match. Greyhounds don’t bark much which is one of the reasons why they popular dogs for apartments and condos. If course if you have a barking dog already they can pick up on those behaviors. Even though most retired racing Greyhounds have spent much of their life in a kennel they’re quite adapt at fitting into a new home environment. Being calm, quiet, having patience, and establishing a routine will help your new Greyhound feel at east in his new home. Please share if you agree. Help spread the word about how amazing Greyhounds are and let’s help find these awesome retired dogs the loving forever homes they deserve. I love greyhounds!! Great post! The first time I met a Greyhound was in middle school and I actually assumed there might be something “wrong” with her because she was so mellow. In my home the only time our dogs were mellow like that was when they were sick or old – but Greyhounds are just amazingly polite and gentle. It’s really surprising to see in such a large breed known for running. I, like Elaine, also thought that since greyhounds are a racing breed, they would be antsy and high-strung. But I just finished a book last week about a greyhound, and I found myself kind of falling in love with the breed…and now your post confirmed it for me! I will definitely be looking into this breed next time I adopt! They seem like such beautiful and gentle dogs. I’m convinced they’re one of the best breeds out there – about as close to perfection as you can get. Before we adopted Laika I had my heart set on a Greyhound but unfortunately she was very uncomfortable around my boyfriend (and men in general) so I didn’t want to bring her into an environment that was going to make her anxious. They’re so mellow and affectionate, so far from what you’d expect seeing them on the track. Great reasons although I thought all of the Greyhound rescues required a fenced yard. Nope. They all do not. I have had Greyhounds for the past 15 years and have never had a fenced in yard. I definitely wouldn’t mind having a Greyhound one day. I’d love to adopt one who was forced to race. It just breaks my heart. I knew someone in middle school with 5 Greyhounds and when I would go to her house, they’d just lay there and relax. So wonderful! It was pretty eerie the first time I met a Greyhound – I thought it was either sick or plotting something evil – but it was just really that chill and relaxed. It’s amazing how calm and quiet they are. You’d be hard pressed to find one that was “forced” to race. They either run or they don’t. LOL. You also are not saving them from a rough start in life, they love their racing life just as much as they love their retired life. I agree Katie… my Greys love to run. They are retired racers and I can tell they were treated well and I am sure they would love to give it a go on the track again… but now they are chubby and out of shape. I learned alot in this post! I never would have thought that they were a mellow breed! Cause like mentioned below everyone thinks of them as racing dogs! What a nicely written article! Greyhounds are wonderful, gentle creatures. So glad that you are promoting their adoption! Greyhounds are such sweethearts. When I grew up I had a dog, Jake, who was part Doberman and part Greyhound. It was a very unique combination. He had the body style and speed of a Greyhound, but the coloring of a Doberman. He was the most gentle dog and was certainly a great dog to grow up with! The few greyhounds I’ve met are just like the ones you describe: easy going and very polite and quiet. I have a friend whose mother adopted ex-racing greyhounds. They were always such wonderful dogs. I love how laid back they are. I can’t think of another breed with such a gentle, calm disposition. They’re such excellent companions. Greyhounds are such an interesting breed. I honestly don’t know much about them so this was nice to read! I’ve always loved greyhounds. They’re such gorgeous, beautiful dogs. They’re so elegant! Waaaaaay more elegant than I am. Great list – hope it encourages some folks to consider greyhounds. They are so elegant, and good natured with a lot of other fantastic attributes. What a lovely informative article, I have recently adopted a rescue greyhound who had a horrible life before he made it to the rescue centre. 6 months on he is blossoming from a nervy anxious underweight dog into a handsome, confident, loving boy. He is great with all dogs, gentle, polite, and quiet at least 14 hours a day! He is just the perfect dog for me, and my second rescue greyhound. They are so underrated and misunderstood, and I always tell people to adopt one if they want an easy life as a dog owner! So glad to know he’s doing so well, I love hearing rescue stories like that. And you’re right about Greyhounds being misunderstood; I’ve often wondered if the fact that they’re most famously known for racing gives the impression that they’re extremely active at home, thus turning off potential adopters. And I agree about them making life easy as a dog owner, the ones I know are the most chill house guests imaginable. I rescued a racing Greyhound who has become my service dog. He is amazingly intuitive concerning my needs and required little training to be helpful. He is extremely polite, gentle and expressive. I cannot imagine life without him! So glad to hear that, he sounds perfect. I’m a happy greyhound owner, and I enjoyed reading this site and its posts. Just one point: dogs (or anyone else) do not lay down; they simply lie down. I have a couple of questions about greyhounds. I should preface this by mentioning that I’ve met a few wonderful greyhounds, but have only once seen one in an off-leash park. At that time, I was shocked as to the speed of the rather large greyhound and a little disturbed that after racing around the circumference of the park, he spotted my mix breed little terrier and went after her. Granted, my little dog barked at him because of the speed and energy he exuded, but never the less, it did startle both of us. The owner stated that this wasn’t normal for her dog, but it has made me a little wary of considering this breed as a potential companion. The other greyhounds I’ve encountered in my daily walks with my dog, have been very mild mannered, but they have all been on short leashes. My devoted, sweet little terrier is now approaching the end of her life and I know, when the time comes, it will be very difficult for me. She is a rescue dog and has been a wonderful companion. Not to put the cart before the horse, but I am the kind of person that needs a dog in my life and I wonder if a greyhound would actually be a good choice. My first question is: I am drawn to the breed, especially after reading all the above comments, but I really need to know if it is typical for a greyhound to attack a small dog in an off leash area or anywhere for that matter? Second: I am a small woman. If I were walking my greyhound and it saw a fluttering bag or rodent or little dog, would it quickly bolt dragging me behind or would it ignore the object and stick by my side? Is it too big or powerful a dog for a petite woman who is over 65? I look forward to receiving your comments. I absolute love this breed, but I need to know if I really should consider one as my future dog. When it comes to chasing (or their prey drive) and attacking smaller dogs/animals it’s hard to give a definitive answer. From personal experience I haven’t met any Greyhounds that have exhibited that behavior (but I also haven’t been to a dog park off leash with them). Like any breed some of them have a stronger prey drive than others, and if you’re going to go through a rescue their profile should say “not recommended for households with other cats/small animals” if that’s the case. I’d say the same thing applies to the pulling on leash; some dogs are easier and calmer on walks than others. I recommend reaching out to a Greyhound rescue in your area. 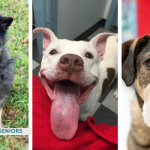 If they’re a foster based rescue they’ll be able to tell you from experience exactly what each dog is like at the park or on leash, and whether or not they have any dogs that would be a good fit for you. Thank you very much for your response. I want to make it clear that my dog was not hurt by the Greyhound at the park. The owner was able to redirect him pretty quickly. He did manage to bump my dog with his nose a couple of times, but other than that, no damage was done. To be on the safe side, we stopped going to that off-leash park. I will definitely check into a Greyhound rescue that is foster based. Your recommendation makes a lot of sense. We adopted (2) retired racers after our last Yorkie passed away last October. We adopted Betty (4) in November and then Q (5) this past May. Neither of our dogs are small dog safe since they have a high prey drive; however, these dogs are everything you read about…loving and gentle and eager to please. Very gentle souls that keep you laughing with their silly poses and antics. I hope you will adopt a retired racer. You’ll never regret it. They are amazing. By the way, retired racers do not need ‘rescuing’ like other breeds. 98% of retired racers are adopted through the many non-profit greyhound adoption groups. 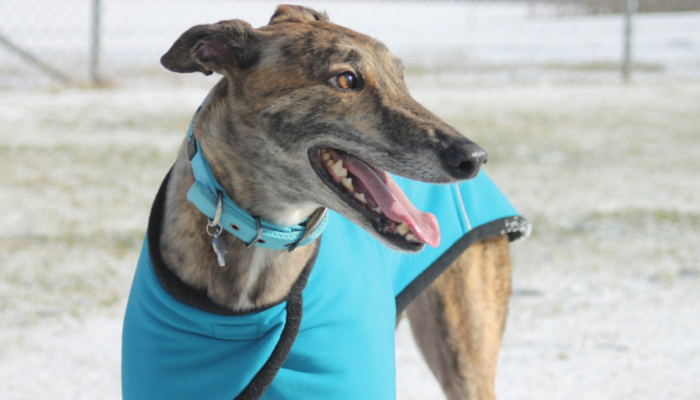 These dogs are athletes and well cared for and loved while they are doing what they love – racing. How can they be the amazing pets they are if they are abused or neglected for 2-3 years while they race?